Crochet afghans with cat motifs are super adorable. After finishing one of these afghans for yourself, you can enjoy a nice cup of tea with your cat on your lap. If your cat is too antisocial, at least you’ll have an afghan full of furry little friends to keep you company. A popular trend with kids these days are animal hats! 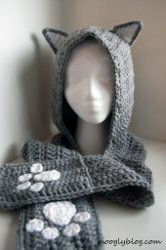 Cat hats are some of the cutest hats you can buy, but why buy when you can crochet and knit one yourself? Work up one of these free hat patterns for a child or grandchild this winter and they’ll be sure to wear it all the time. 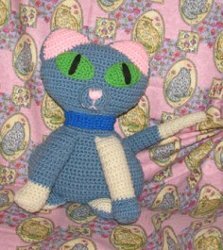 Kids love curling up with stuffed animals and you can crochet a custom kitten for the little one in your life. 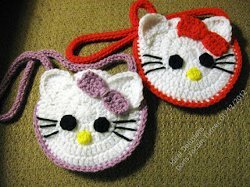 Some of these patterns are inspired by the popular Hello Kitty and you’ll fall in love with the cute kittens below. Work up one of these cat toys and fill it with catnip to see your cat have a fun afternoon. 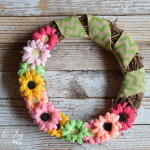 These free patterns are great for using up bits of scrap yarn. I was looking for a pattern for a small dog hat. I’m thinking these cat patterns will do the trick! I am trying to get the pattern for Cat & Mouse Throw and Pillow and the website link won’t let me just get the pattern. It is trying to force me to get yarn and needles when all I want is the pattern… *Sad face* Cause I would make this in a heart beat. I already have yarn that I want to use and plenty of needles…. does that make me a crazy cat lady ???? Madi, did you scroll all the way down the page, past the 3 sets of yarn offerings? That is where the patterns are. Yes, I’ve made cat pillows for my grandkids. where did you get the pattern? i’m in search of!! I LOVE CATS TOO.I HAVE 2 LARGE MALE CATS AND I GET HUNDREDS IDEAS OF WHAT TO KNIT FOR THE ANIMALS. I am looking for a baby blanket pattern with a cat or kitten on it. My son and daughter-in -law are having a baby and she is a cat freak. THANKS! I am searching the world for a cats head crochet afghan that was published in the 1997 November/December #66 issue of Hooked on Crochet magazine. Does any one have it or know where I can get it?? There is just not enough Knit applique patterns.